The latest news for celebrity sign ups is Julia Roberts for Lancome. You might have already seen many beauty blogs abuzz with this info. Yes, the Oscar winning actress who captured many a heart with her mega watt smile is going to be the face of Lancome from 2010. I think they are going to capitalize on those lips with L’Absolu Rouge perhaps? 🙂 They’re already touting Rich Cashmere as her colour! And L’Oreal picked up a celeb too – tis must be the season for celebrity signings. 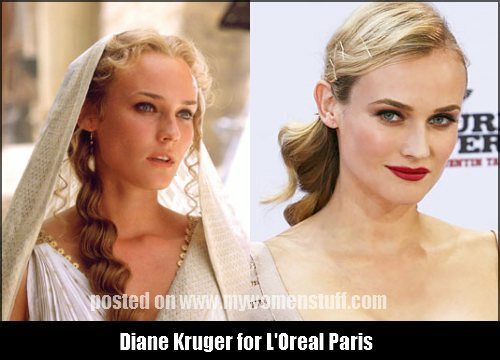 And while L’Oreal was at it, WWD reports that they have snapped up another celebrity spokesperson for the L’Oreal Paris makeup line in Diane Kruger. I didn’t know who she was – perhaps I’m living under a rock – but she starred as Helen in Troy and most recently appeared in Inglorious Basterds. She’ll join Penelope Cruz and Eva Longoria and I expect we will be seeing quite a bit of her around soon 🙂 I love that red lip look she’s rocking! I got a strange one this week asking “how can i lower my high heels”. Well dear other than suggesting you buy new lower shoes or lobbing off the heels of your current pair, I’m not quite sure how else you can lower your high heels. Ideas anyone? DKNY Delicious perfumes are popular. The bottles shaped like apples are so cute! I remember they came up with something pop art this year. But in February 2010, look out for the DKNY Delicious Candy Apples range. I like the idea and the names but I’m thinking the scents sound a little too sweet for me. I haven’t quite tried the DKNY Delicious line of perfumes though. So perhaps I’ll go take a sniff. Read more about the DKNY Delicious Candy Apples at the Scented Salamander. I’m glad you’re enjoying my random search of the week. I’ll keep looking out for more random ones 😉 I’m thinking of doing my hair too – getting it cut that is. Can’t wait to see your new do! I wasn’t aware of the heel supporter but I think ultimately it’ll be more comfy just getting a new pair? i’ve always been tempted to buy from StrawberryNET.com but not sure of their reputation. have you had good experience with them thus far ? I’ve never had problems with Strawberrynet and I’ve bought from them over 20 times! I am interested in the YSL Love Collection Compact Powder, but not sure if the shades will suit me. Have make the order? I am towards fair skin too. Oh great! Hope you will do a review on it pretty soon.